I'd like to wish John Green, one of the best young adult authors in the world a very happy birthday. John's works have given me so much enjoyment and pleasure. I consider his stories and characters life time companions. The videos he and his brother make are just great. I love Nerdfighteria and everything it stands for. I will be forever thankful for John and Hank's existence and awesomeness. The image you see up there is Hank's awesome birthday gift to John. 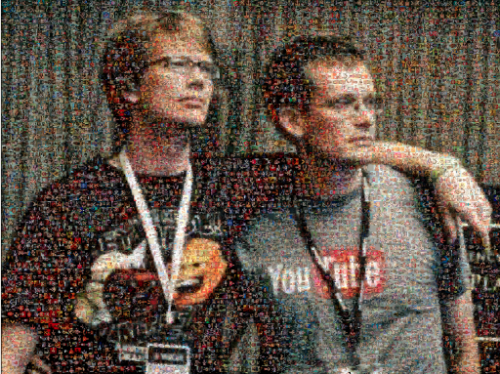 It is made up of tiny pictures of Nerdfighters all over the world. It looks awesome and is metaphorical and symbolic. We all know how much John loves metaphors. It was a shame because I didn't get a chance to submit my own photo because I checked my email right as the deadline passed. I haven't gotten to read The Fault in Our Stars or any other John Green's books, but I heard they are amazing! I really hope that I will be able to get it soon. That pic is so cool! Hank did a great job. Happy birthday to John Green! They ARE amazing! They're one of my all time favourite novels, especially TFiOS. You need to get your hands on his novels.